We listened to your feedback regarding the previous iterations of Direct Planning and we are proud to introduce the new features of version 3.2! In addition to optimizing the functions you already use every day, it includes many innovative functionalities that will allow you to plan with even more efficiency. You can still use the selection box as well as the Ctrl+click function to extend the selection. For “long distance” movements, you no longer need to use the drag and drop function: You can now simply select your job, go to the drop location, do a right click on the planning background and click on “Move selection here”. If you wish to move your selection to a location where the planning already includes jobs, you can still display this context menu by right clicking right above the job. The addition of the “Move selection here” option replaces the Cut and paste function (and associated shortcut Ctrl+X) that was rarely used in Industry mode and Project mode because it broke the links. The green dotted vertical line represents the most binding of the earliest start dates among the selected jobs. The orange dotted vertical line represents the most binding of the latest end dates among the selected jobs. 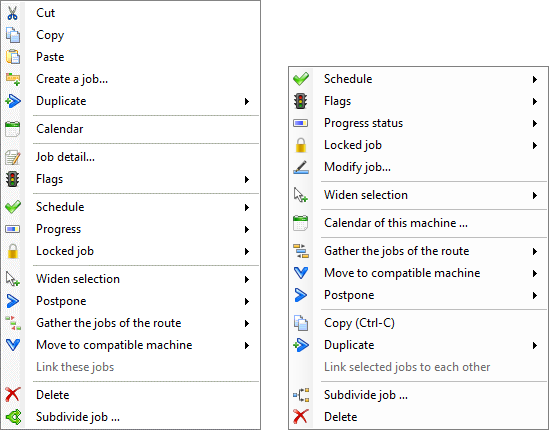 The context menu ”Gather the jobs of the route” is now available. From left to right for every selected job, it consecutively groups every respective route. The vertical repositioning of the planning has been removed because it could be inconvenient during a drag and drop operation. In the context menu of a job, we have retained the “Copy (Ctrl-C)” function. The Paste shortcut (Ctrl+V) remains available to copy the selected job right behind it. The former duplication action “Ctrl+Drag and drop” has been removed because it was too risky. This brand new functionality is available from the ribbon and from various context menus (e.g. on the name of a machine on the left side of the planning). You can also access it rapidly by selecting a job and pressing Ctrl+P. List of scheduled jobs and jobs to schedule colorized by material code. The left side of this window displays some standard columns that cannot be changed. 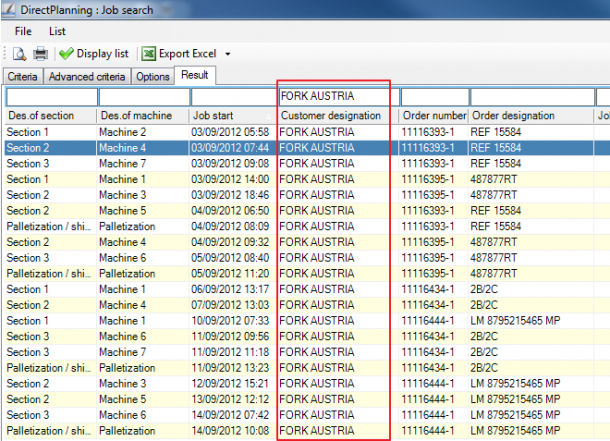 The right side allows you to customize the columns for this shop floor (with a right click on the column header). 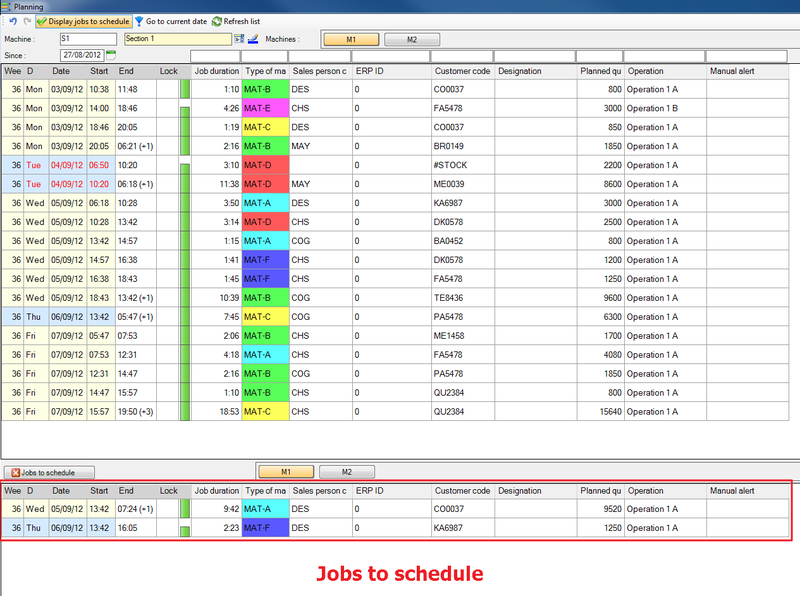 This way, you can view as columns the technical data that are useful for the scheduling. 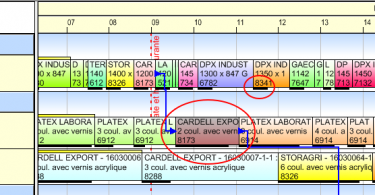 For a given section, you can configure the background colour of the “End” and “Lock” columns, for example as per an important technical data for this section. In these lists, you can select one or more jobs and drag and drop them to their desired location. When you enter a column header filter (e.g. 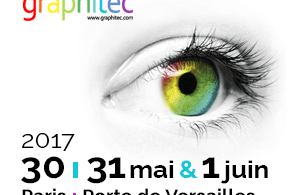 a material code) a background colouration allows you to identify the lines that match this criterion. allow you to switch between machines, for the scheduled jobs as well as for the jobs to schedule. 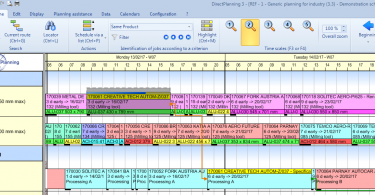 A click in the table also selects the job in the Gantt and conversely. 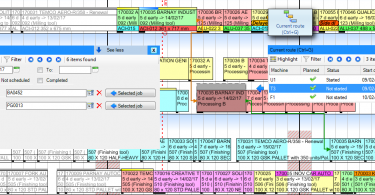 A double-click in the list allows you to refocus the Gantt, by bringing that job into focus. This list is not intended to be opened all the time because managing the list and the Gantt simultaneously has a negative impact on response times. 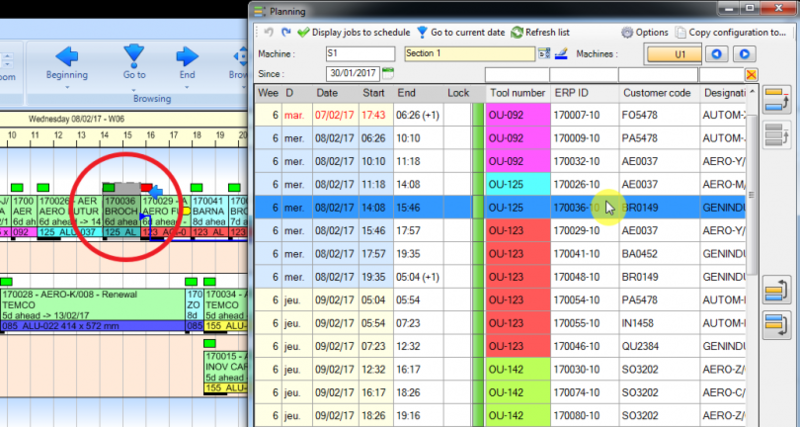 Right click on a job in Direct Planning 3.1 (left) and Direct Planning 3.2 (right). For display modes without flags, an inactivity area crossed by a job could be hard to spot. Thanks to an increase of the line height, such jobs are now visible in all cases. Keyboard shortcuts are now better indicated in menus. If select a job on a machine, the “Alt+End” shortcut now takes you to the last job for this machine, whereas the “Alt+Home” takes you to the first “unfinished” job for this machine. Offering the same functionality as the “+” and “-“ keys on the numeric pad, the new shortcut “Ctrl+Shift+Mouse wheel” allows increasing or reducing temporarily the scope of visualisation for the planning. By default, the workload histogram now opens with a more relevant scope of visualisation: 3 weeks. As a reminder, it defines the periods of time to hide via the “Compact time scale” function. 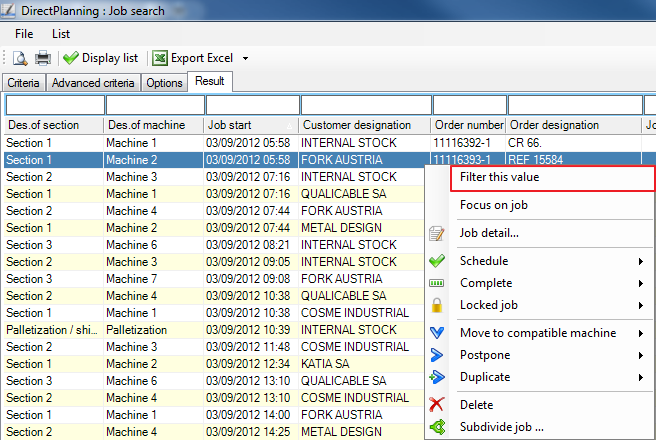 From the search window, a double click on a job selects and centres the planning on that job. However, a little job could be hard to locate. In this column, the chosen filter is the “Customer designation”. After clicking on “Filter this value”, we can notice that the filter “FORK AUSTRIA” is populated and applied. All the resources (the machines in Industry mode) of the planning are now displayed, even if the resource line does not contain any job. If you wish to exclude some resources, you can do it when you configure the display modes. In case of anomaly, the mail sent to the support now includes your Direct Planning version number in the subject line of your message.